Making a big leap from the world of Marvel to DC, Joss Whedon is in talks to write and direct a movie based around Batgirl, according to Variety. Having directed the two Avengers movies, as well as helping to created Agents Of S.H.I.E.L.D., Whedon has been instrumental in the success of Marvel’s cinematic universe. Warner/DC will be hoping he can bring some of the same magic to their movies, which have struggled with critics and failed to ignite the type of fan fervour Marvel has managed. There’s no info on what direction Whedon might want to take the character, or indeed when we might see the movie. However, it’s likely he will be working with the most iconic Batgirl, Barbara Gordon, the daughter of Commissioner James Gordon, who secretly dons a costume to fight crime. She was first introduced in 1967 both in the comics in in the Batman TV series. Whedon’s film is likely to involve other characters from the Gotham universe, and will also connect to other films in the DC universe. Marvel must have been licking their lips when some genius came up with the idea of throwing all of their superheroes into one film to fight against evil. However The Avengers was a gargantuan success, becoming the third highest grossing movie ever. Now comes the sequel, Age Of Ultron, which has a lot to live up to. The result is a series of brilliantly executed set pieces, but inevitably the characters get lost in the mayhem and some of the actors look like they’d rather be elsewhere. Several weeks ago a slew of posters were released featuring the main characters from Avengers: Age Of Ultron, from Aaron Taylor-Johnson’s Quicksilver to Robert Downey Jr’s Iron Man. However one character was missing – Paul Bettany’s vision. Marvel has now remedied that with a great poster featuring Paul Bettany’s slightly creepy-looking character in the movie. Not too much is known about how the character plays into the film, although it is known Vision is creating the J.A.R.V.I.S. technology which Bettany has voiced in earlier Marvel movie. There will definitely be problems with that though, as the Ultron also emerges when Tony Stark’s plans to use technology to create guardians who will protect the world when the superheroes aren’t available goes horribly wrong. It would seem reasonable to assume Ultron and Vision are two sides of the same idea. Indeed recent reports suggest Vision is created when the robotic Ultron goes rogue and tries to destroy J.A.R.V.I.S., but accidentally gives birth to something unexpected. A couple of days ago we got the first Avengers: Age Of Ultron character banner, featuring Robert Downey Jr.. Now four more have arrived, giving us a look at Hulk, Black Widow, Thor & Nick Fury. It stars Robert Downey Jr., Chris Hemsworth, Mark Ruffalo, Chris Evans, Scarlett Johansson, Jeremy Renner, Don Cheadle, Aaron Taylor-Johnson, Elizabeth Olsen, Paul Bettany, Cobie Smulders, Stellan Skarsgård with James Spader and Samuel L. Jackson as Nick Fury. 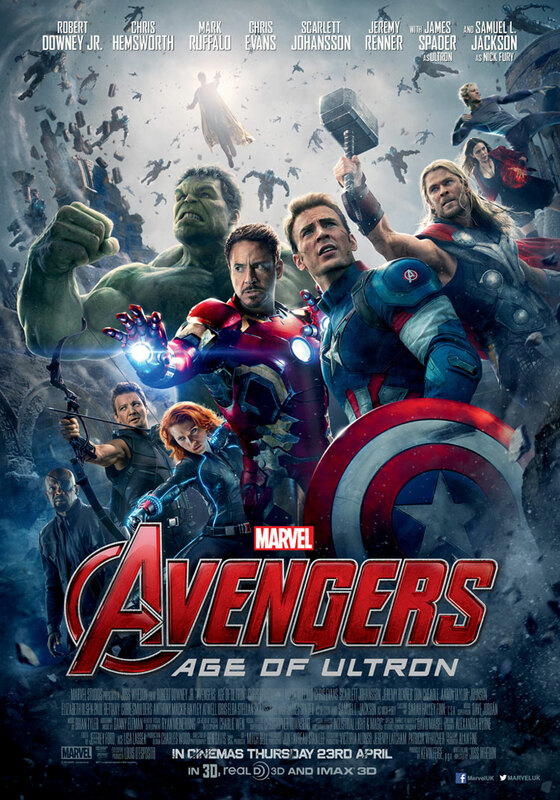 Avengers: Age Of Ultron reaches the UKon April 23rd 2015 (and a week later in the US). After yesterday’s full Avengers: Age Of Ultron posters, it’s time for one of the characters to get their own poster – and it’s not too surprising that first up is Robert Downey Jr’s Iron Man/Tony Stark, who’s looking as cool as you might expect – even if he is responsible for creating the movie’s villain. 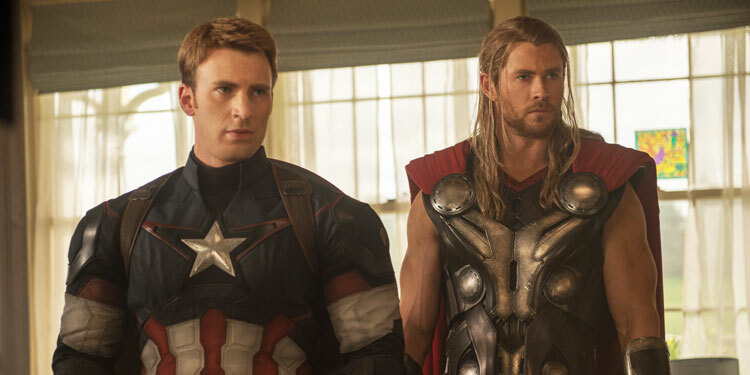 Avengers: Age Of Ultron reaches the UK on April 23rd 2015 (and a week later in the US).